OK. Just kidding. Actually I left the project because I needed to concentrate my time on my work in the liberty movement and school, and when push comes to shove, the little green lizard got shoved. In the process, I had purchased a copy of Windows 7 when Microsoft was selling it for $50, and so I essentially switched over to using Windows 7 for a few months. In the end, I moved back to openSUSE because it’s, quite frankly, a better experience in many ways. 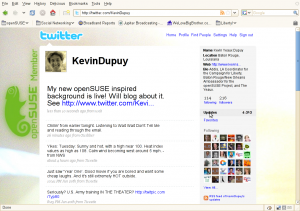 I’ll probably write up an article or two in my comparisons between the two OSs… but I’m back now, using openSUSE 11.2. 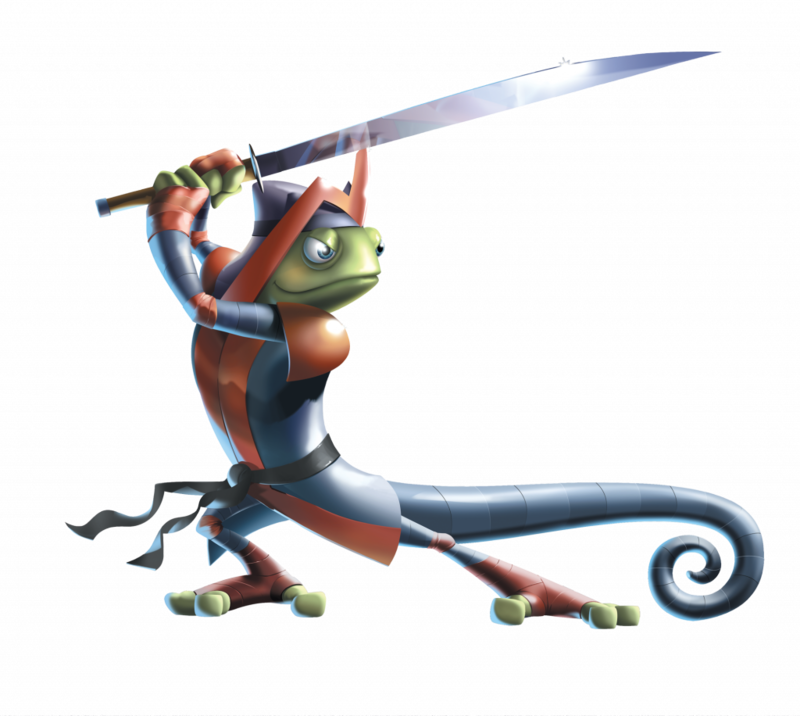 In the course of these three months, I have to say I missed working with the openSUSE Project, especially the people. So… I’m back! I re-uped my mailinglist subscriptions and have been reading back articles of openSUSE News to try and catch up with what’s been going on in the project. I’m excited to be back and I look forward to working with you all again! Now that work and school has started to settle down, I’ve gotten back in to testing openSUSE’s newest version, 11.2. One of the things that annoyed me a little, though, was having to open Firefox to report or search for a bug in Bugzilla. So with a little inspiration from the Windows 7 beta’s links to “report a problem” everywhere, I created a desktop icon and panel launcher to automatically launch Firefox and open the “enter new bug” page on our Bugzilla. You can download this icon here (right-click and Save Link As). Perhaps this is something that should be included with the pre-release versions of the OS starting in 11.3? What do ya’ll think? Because I feel a tad bit guilty about missing all of the Community Week sessions this week (school and work training, and before you ask, I’ve got more training all this weekend, so I can’t make those sessions either), I did decide to do a quick tour of the GNOME Shell, one of the integral parts of the GNOME 3 series, scheduled to be coming out in 2010 or so. Note the Activity menu and the specially-capulated notification area. Good stuff. I al so like the stylized panel, but I don’t like it at the top. When openSUSE adopts GNOME 3, I’d like to see it moved to the bottom. Clicking on the Activity menu opens this menu. The desktop shrinks into a side (and you can create or remove as many as you wish, which is seriously awesome), and opens the most recent Applications and documents (I think). If you wish to open an application, double-click or drag the icon onto the desktop you wish it to open to. Here I did a simple search for SUSE. Applications and documents that matched that search pop up (although I’m not sure what indexing service that is, I’m relatively sure it’s not Beagle, openSUSE’s desktop search indexer). Here’s an expanded view of the search for apps with SUSE. 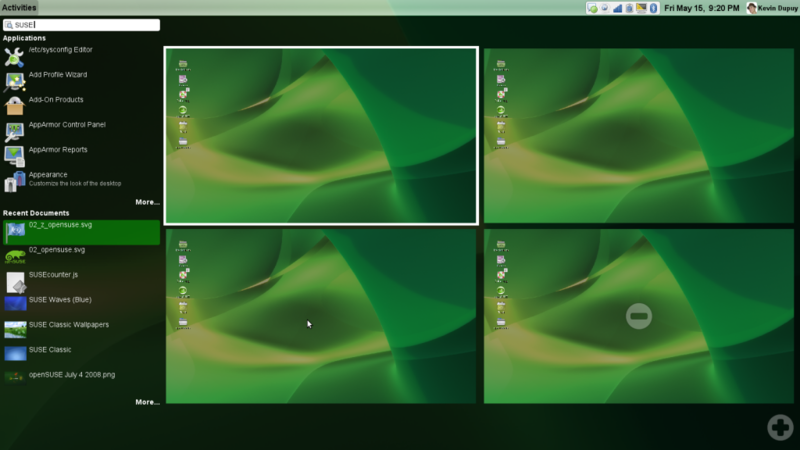 The desktops slide out of the way, and a multi-column (and page) view pops up. To open, drag an icon over to the right (onto the desktop). Overall, I like it. Combined with the new stuff coming next year in GNOME 3, this could be quite an interesting release. One of the most important things to note is that this interface seems incredibly tailored toward netbook’s small screens. No joke. Happy April Fools Day, I guess. openSUSE 11.0 Now Available for Pre-order! 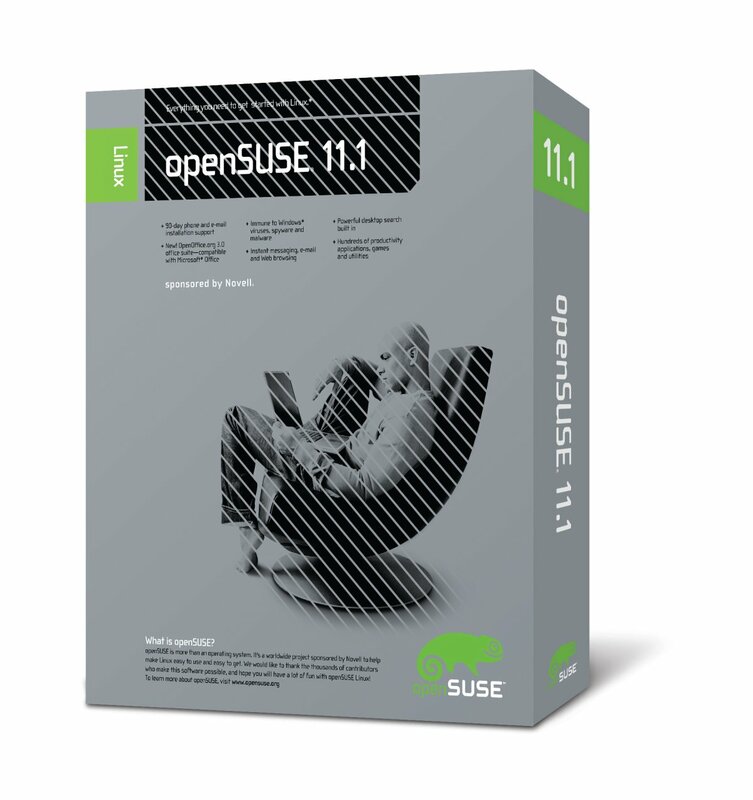 It was quietly put up on the Novell store front page but openSUSE 11.0 is now available for pre-order! The boxed edition of openSUSE, which I have long been buying, has stayed the same, kinda bland looking white with a big lizard for a long time. But with 11.0 comes a new design that looks extremely slick and cool. Hopefully that means they’ll try to avoid the tough time I and several others had getting a boxed edition in the United States (pre-ordering openSUSE, then getting it five weeks later, or four weeks after public release). They also don’t have the promotion from last year, where if you pre-ordered openSUSE 10.3 you got free shipping. Maybe that’s a trade-off for getting it at a reasonable time, if so I’m cool ;-). UPDATE: According to an email Novell just sent out, free shipping is back if you pre-order, at least in the US. Also, a commenter said there is free shipping in Germany too. 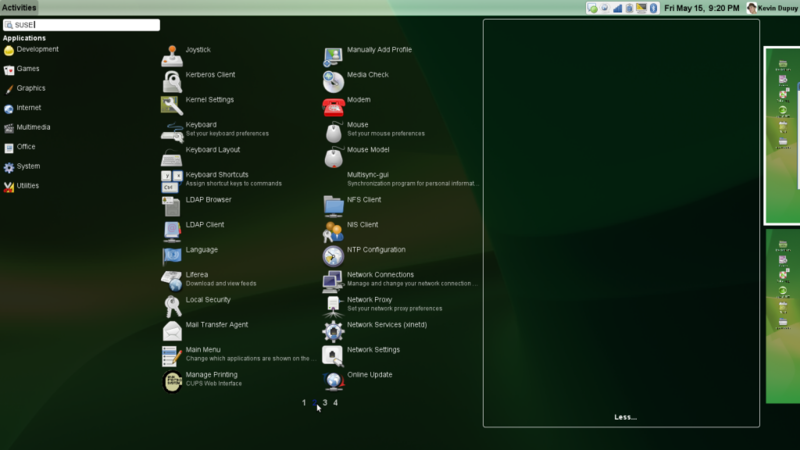 openSUSE 11.0 and Vista Users (Poor souls): How’s Dual-booting? delay 11.0, so please help me. 11.0 Installation Walk-Throughs Mostly Done! 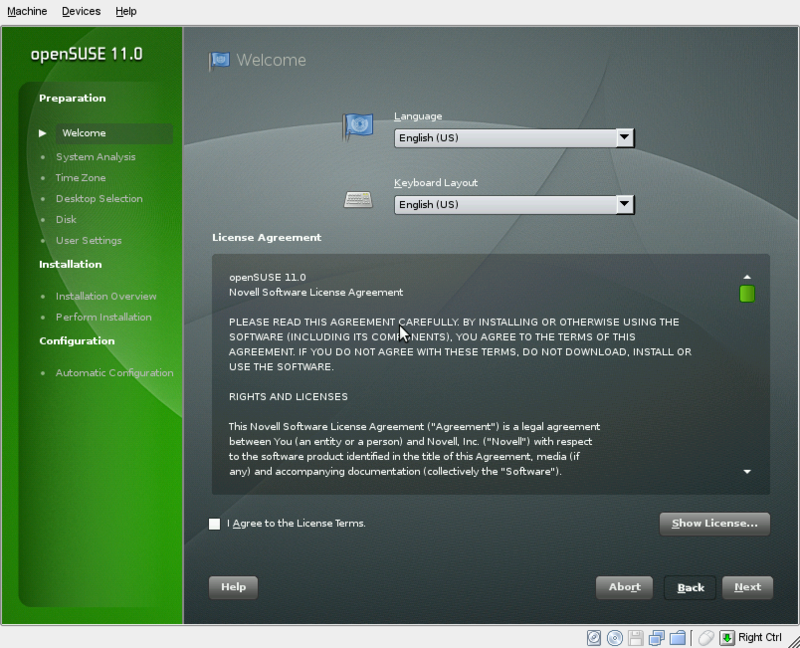 I’ve got the openSUSE 11.0 installation walk-throughs mostly done! I say mostly, I did get the DVD installation tutorial completely done and published, but since we have a little over two weeks, if anyone has anything to add or correct to it, there’s plenty of time to do so. I also mostly finished a walk-through of the Live CD installation, but I’ve still got a few screenshots to add and corrections to make, so if you’ve got time take a look at both and help out, help us make them awesome easy to follow by release day! I thought about just copying the instructions from the 10.3 Installation tutoral and adjusting them to 11.0, but since there were so many changes in the installation it would be more trouble than it would be worth. So let’s raise a toast to the YaST developers for making the new installers really nice and spiffy! And thanks to Jonathon Arnold, hieronymus on Twitter, for providing me with the screenshots for the DVD installation! Also, since I think this is my first post on Planet SUSE, hey everybody! I’ll just link to my bio.